BOSTON - Police officers swept through Dewey Square early Saturday, tearing down tents at the Occupy Boston encampment and arresting dozens of protesters, bringing a peaceful end to the 10-week demonstration. Officers began moving into the encampment at about 5 a.m. to "ensure compliance with the trespassing law," police spokeswoman Elaine Driscoll said. The city had set a deadline for midnight Thursday for the protesters to abandon the site but police took no action until early Saturday, making Boston the latest city where officials moved to oust protesters demonstrating against what they call corporate greed and economic injustice. As police moved in, about two dozen demonstrators linked arms and sat down in nonviolent protest and officers soon began arresting them. The protesters were "very accommodating" to the officers, Driscoll said. Forty-six people were arrested on charges of trespassing and disorderly conduct, police said. No injuries were reported. The entire operation lasted less than an hour. "In the interest of public safety, we had to act," Mayor Thomas Menino said. "Our response was about respect for people. We have to remember people must be our focus in government." Protesters transmitted live video from the scene showing officers taking down tents. Footage showed numerous police in yellow and black jackets moving across the square that had been occupied by protesters just minutes earlier. 'If you don't leave the park, you will be subject to arrest. You are trespassing on Greenway property,' a police officer said through a megaphone. 'Tell me what democracy looks like. This is what democracy looks like,' demonstrators chanted back. About two dozen linked arms and sat down in nonviolent protest, preparing to be arrested." On Saturday afternoon, Dewey Square was blocked off by metal barricades, and about 15 police officers were stationed at points around the small park as workers aerated the compacted soil, spread new soil and prepared to lay turfgrass, probably by early next week. Graffiti and signs that marked a bordering building had been washed off, and workers cleared out shrubs and flower beds. Steve Anderson, director of park operations at the Rose Fitzgerald Kennedy Greenway, which Dewey Square is part of, said he conceded to protesters early on that the lawn would be ruined, but they cooperated with his requests to spare shrubs and trees and not camp on certain areas. "In general, they were very respectful. There was a couple of wise guys, but in general," Anderson said. "This is really just bringing the lawn back and getting it to the place where the public can enjoy it again." A couple of people who'd been part of Occupy Boston lingered around the outskirts of the former tent city as workers removed all traces of it. A 25-year-old Boston artist, who would only give her first name, Katherine, because she did not want to seem to be speaking for the group, watched the work across the street from her bicycle. "I feel like, `Oh no, you guys don't get it. You're gardening?"' she said. "If they think they can like, you know, plant grass and the movement's going to go away, it kind of makes me laugh." Protesters first erected the encampment on Sept. 30 about two weeks after the first Occupy Wall Street protesters started an encampment in a privately owned park in lower Manhattan's financial district. 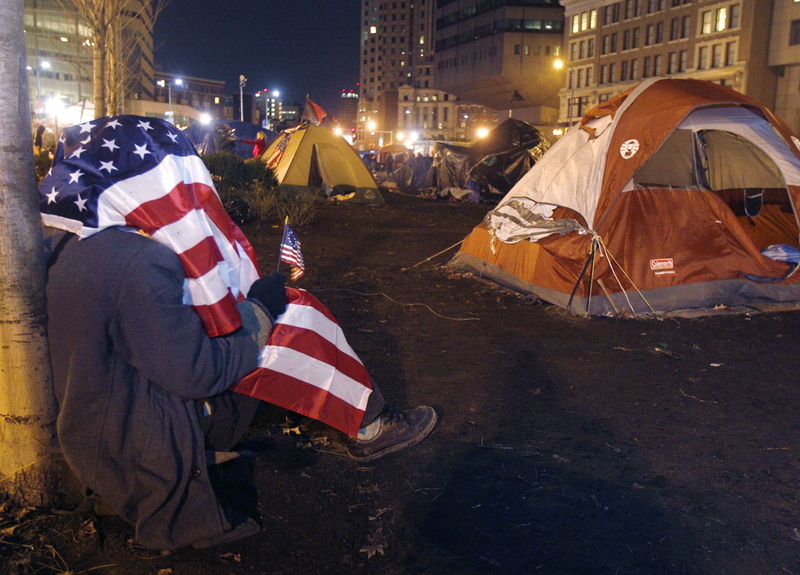 Many of the Occupy Boston protesters pulled up stakes and left the encampment Thursday after learning of the midnight deadline Menino had set for them to leave the square, but others stayed, and some said they were prepared to be arrested. While Menino previously had said the city had no plans to forcibly remove the encampment, he appeared to become increasingly impatient with the protesters in recent days, saying the occupation had become a public health and safety hazard. He issued his ultimatum after a judge ruled on Wednesday that the protesters had no right to stay in Dewey Square. Protesters estimate that 100 to 150 activists lived in the Boston encampment. Demonstrators were forcibly removed from similar encampments in New York City, Los Angeles, Philadelphia and San Francisco. Menino said overtime costs for police patrolling Dewey Square were nearing $1 million, out of this year's $30 million police overtime budget. As an officer stood near the empty plaza, a stray sign blew over the bricks before sliding to a stop next to him. It read: "Thanks everyone for your love ... Chapter Two starts now!"